Access Healthcare offers SculpSure Body Contouring, a smarter way to sculpt! Save money on your prescriptions by using our search engine for the lowest prices near you! 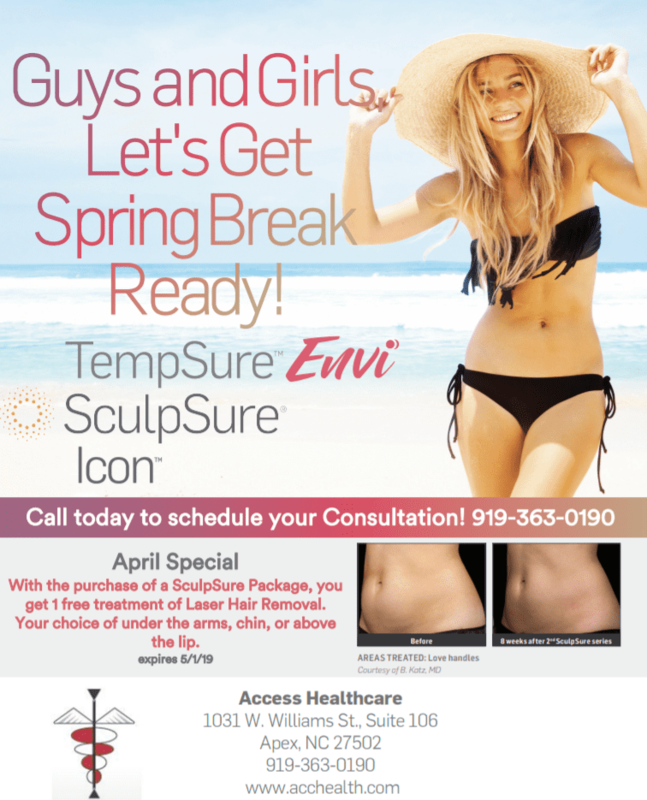 Learn More today about TempSure Envi Skin Rejuvenation with Access Healthcare. Reveal and restore youth and vitality with our Icon Photofacial. Access Healthcare is committed to providing high-quality medical services to the population of Apex, North Carolina, in southwestern Wake County. Motivated by the need for more patient-friendly healthcare services, the practice offers direct primary care, which cuts out the bureaucratic clutter and gets down to the business of providing great healthcare that’s affordable, readily available, and less complicated. Through a simple and affordable fee schedule, patients can access convenient and affordable primary healthcare services, without the hassles and cumbersome oversight of insurance companies that remotely dictate care. The care the patients receive at Access Healthcare is top-notch. The physicians on staff — Dr. Brian Forrest, Dr. Heather Mullens, and Dr. Keely Godwin — all take pride in offering advanced medical care that treats the whole person. With vigilant preventive care and expert medical oversight, the doctors at the practice partner with their patients for long-lasting health. From managing cardiovascular issues and chronic diseases like diabetes to routine wellness checks and primary care, Access Healthcare is able to handle 90% of its patients’ needs, while also providing personalized and compassionate service. Understanding that patients want to feel well on the inside and look good on the outside, Access Healthcare offers cosmetic services, using the latest laser technologies to tighten skin, reduce fat, and remove hair. If you’d like to get started on direct primary care at Access Healthcare, call or use the online scheduling tool on this website to book an appointment. We strive to make quality healthcare more affordable, available, and less complicated to access. Our fees are so reasonable you do not need to use health insurance. "Dr. Forrest has been a godsend to my family. He is an extraordinary doctor and an extraordinary human being. I could never thank him enough for all that he has done." "I have used a (Direct Primary Care Practice) for eight years and the care that the Doctor and his staff provides is excellent." "I have been a patient of Dr. Forrest since 2011 and..have overall vastly improved health and feel great knowing that I have Dr. Forrest on my side."